Quilting can be a very solitary activity. But isn’t everything better when you can do it with a friend? Here at Quilted Joy, we have five longarm quilting machines that we rent. We will often get pairs of ladies that come in together to quilt. They each have their own machine, and they’ll chat and help each other with quilt design and thread choices. This can be a super fun activity to share with a friend. Find yourself some quilting buddies and come to Quilted Joy! The first quilt we have to share is one that Judy quilted. It is a sampler quilt in bright blues, greens, and yellows. She quilted it with an edge to edge pantograph called Periwinkle. It’s a fun design that adds a little whimsy to a classic design. Judy also made this Sunny Skies quilt in teal and blue for a friend’s wedding. She quilted it with a gold Omni thread which I think was an inspired choice. She quilted it with an edge to edge paper pantograph called Cascade. It adds such a nice flowing movement on top of the straight lines of the squares and half square triangles. Judy’s quilting buddy, Valerie, has also made some spectacular quilts. This stunning pineapple block is amazing. I love the bright colors! Setting it all in a white background just makes those colors, and the shapes they create, pop. Valerie quilted this with a paper pantograph we sell here by Bethanne Nemesh called Serpentine Feather. Nemesh feathers are not strictly traditional, but they are beautiful. Quilted on this traditional quilt pattern with modern colors just seems to fit so well. And I absolutely love her backing fabric! It’s the Timeless Treasures 108″ wide Dot Swirls fabric. Doesn’t it remind you of Skittles? This is another quilt from Valerie where she took a very traditional star but used white fabric as a background and bright solids for the stars. They’re all connected in the corners, but seem to float on the white backdrop. 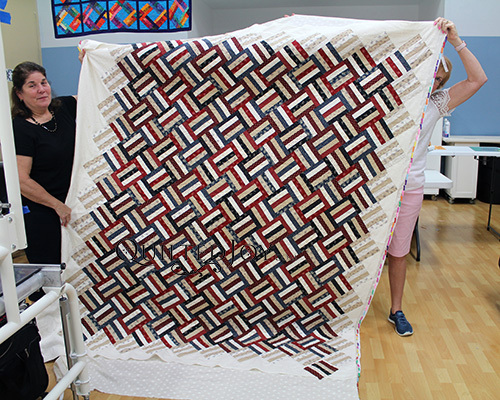 She used a pantograph, Honey Drops, to complete this quilt. It has a lot of soft curves that pair well with the straight lines in her stars. Jennifer and Anna Maria go a step further as quilting buddies. They shop together and will complete Blocks of the Month together as well. The first two quilts are a pattern by Primitive Gatherings called “Patriotic Split Rail.” They bought it while on vacation in Florida. That’s Jennifer’s quilt above and Anna Maria’s below. Both quilts were pieced with antique colors and both quilts were quilted with one of our star pantographs. Anna Maria used Star Dance, and Jennifer used Shooting Stars. Both were great for these Americana quilts. Here’s another Block of the Month quilt they made together called “The Moon Glow Quilt”. They put both of them on a backing fabric from Timeless Treasures called Geo Circles which could not have looked more perfect. The colors were perfect for the quilt top and I love how the fabric reminds me of A Starry Night by Van Gogh. They also picked similar designs to quilt them. Anna Maria chose to use the Turbulence pantograph which contains a lot of swirls. Jennifer used our spiral design board. Both added a little magic to this dreamy quilt top. If you are looking for an activity that you can do together with your own quilting buddy, come to Quilted Joy and make more than just memories together.